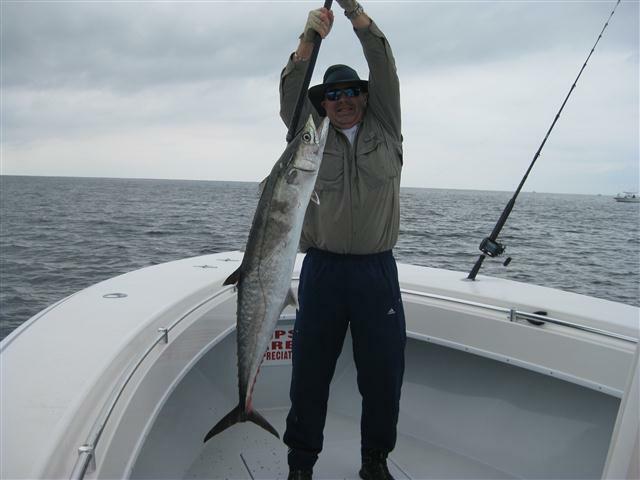 Here are a couple pictures from one of our Fall King Mackerel live bait trips. Hope to be getting many more pictures from the groups we took. Some of the biggest Spanish come in Oct also. 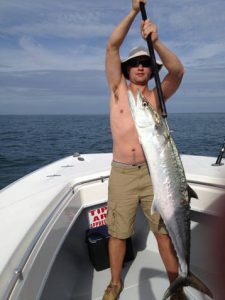 The last four days nearshore has been a roller-coaster ride while fishing for King Mackerel. For some reason they would bite one day and “lock jaw” the next. This is fishing and we can only be at the right place at the right time. Now on the days the Kings did not want to bite the biggest sharks we have caught all year are here and they are a blast to catch. So tight lines with big fish have been no problem. 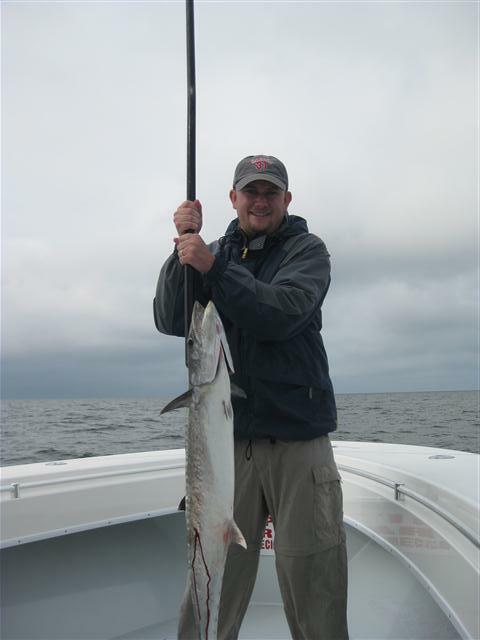 Looks like Tues and Wed we will be looking for the King Mackerels again. The past several days has provide some hot Shark fishing and King Mackerel fishing. The Sharks are 100-200lbs and all you want to catch. 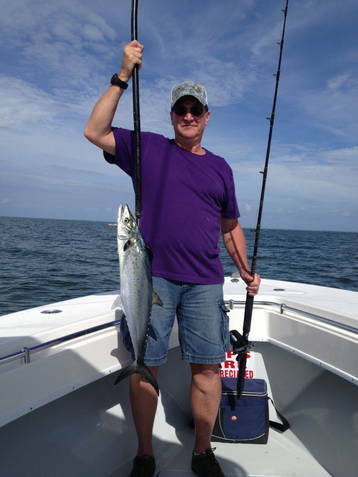 Now the King Mackerel is a different story you have to be very patient and wait for the tide to get right. Once the tide is right its wide open with King Mackerel jumping on every Live Bait that’s swimming behind the boat. The fish are still in the larger size with fish avg is 30lbs. 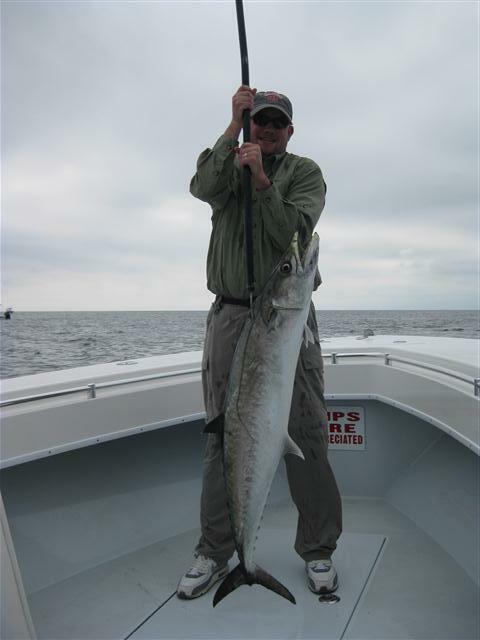 Fall fishing nearshore is great with Live Bait. Once again today we proved Live Bait for King Mackerel nearshore is a hot ticket this time of year. Good news is it should only get better as the water temps ease down to the low 70’s. Starting to get some pictures in from the last several Live Bait king trips with Big Kings and Big Spanish. Remember live bait fall fishing makes good fishing better. With all the King Mackerel we have been catching you would think nothing would change and they would bite like clockwork. Well its fishing and they decided to go 30 miles north and south of us instead. Not to be outdone we tucked in behind a shrimp boat and once again more big 6-8 foot Spinner Sharks than you could imagine. After doing battle for hours we went looking for smaller fish “now thats a good problem”. Looks like Grouper fishing Friday. During the last several days we have switched things over to live bait fishing and the rewards are great. You catch bigger Kings and bigger Spanish this way while fishing close to the shore. If the wind is blowing its no big deal just like yesterday “day after full moon” and East wind we still had steady action while kite fishing. 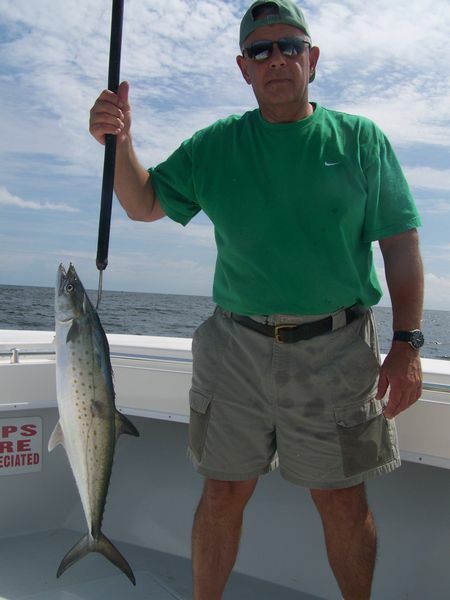 Limit of Kings and 12 5-6lb Spanish Mackerel. Remember live bait makes good fishing better.